Veterinarians throughout the country are reporting a rise in cases of Canine Parvovirus. The virus has mutated into a more virulent strain, making it harder to kill. In the past, veterinarians would recommend the use of a bleach solution to kill the virus in the home, but more and more studies have shown that household bleach doesn’t kill the virus and both businesses and homeowners are afraid to use the solution, as it will damage surfaces and cause upper respiratory problems in both humans and animals. 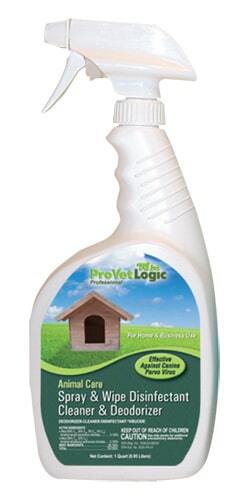 More and more veterinarians across the country are recommending ProVetLogic Spray & Wipe Disinfectant, which is the only animal specific, EPA Registered Ready-To-Use Disinfectant that is effective against Canine Parvovirus. Did you know that a number of viruses, including Canine Influenza Virus is spread through dog hair and that many groomers are unaware of this fact? Professional animal care providers and home pet owners are more knowledgeable than ever and are becoming more savvy when selecting products for their pets. Whether it’s a grain free food or all-natural shampoo, it’s what’s on the label that gets their attention. 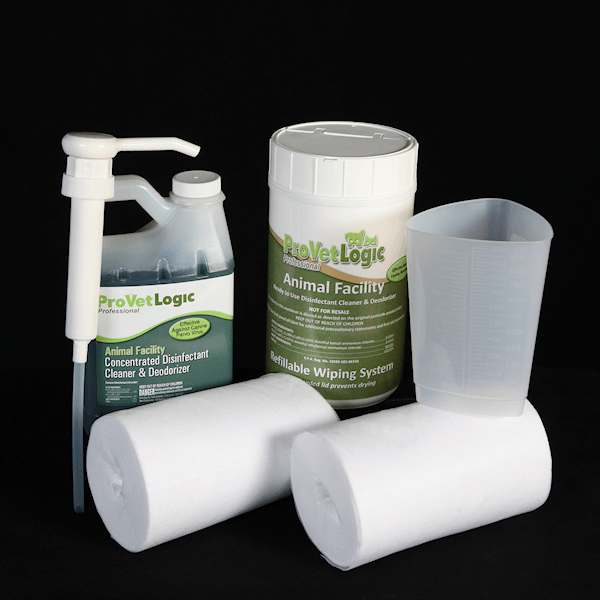 ProVetLogic’s Spray and Wipe is the only EPA Registered, Ready-To-Use Animal Specific Cleaner on the market that is effective against Canine Parvovirus. Strong enough for the professional, but safe enough for the home pet owners. Helps to control pet-to-pet cross-contamination in the business and home environment. This picture illustrates how to clean a crate with spray and wipe. Just in case you can’t read the steps, here they are. 1). If possible, remove the door and separate the top and bottom of the crate. 2). Remove all loose debris, bedding, toys, etc. 3). Wipe away any heavy build-up of urine or other bodily fluids. 4). Apply Spray N’ Wipe to all surfaces and allow to remain for a MINIMUM of 10 minutes. 5). Agitate the surface to remove soil build-up. 6). Wipe dry excess fluid.